Success! Mercury has a new satellite named MESSENGER! 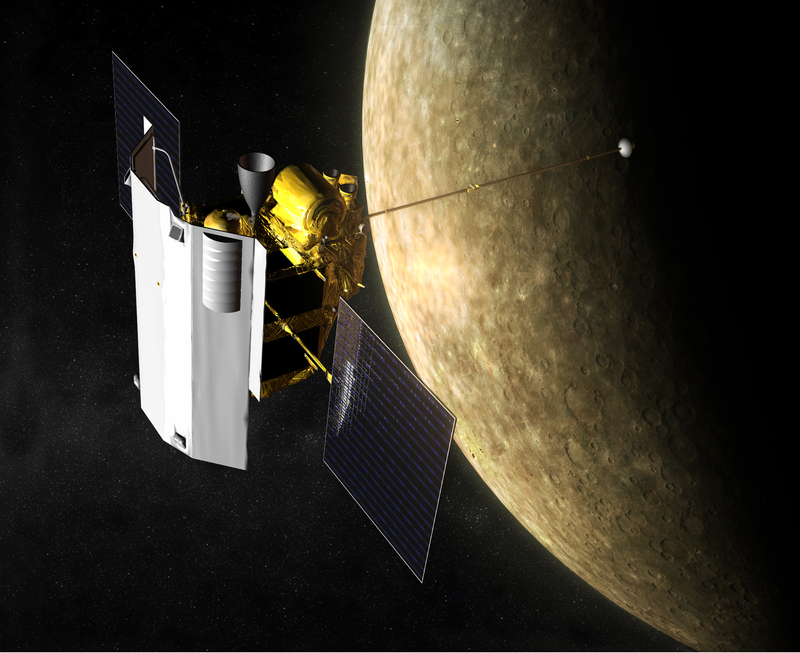 Artist's impression of MESSENGER orbiting Mercury. During a week of not-so-great news in the world (to understate things by quite a lot) it’s nice to report something good: the MESSENGER spacecraft has successfully established orbit around the planet Mercury, beginning its new 12-month mission of mapping and researching the innermost planet of our solar system! After traveling nearly 5 billion miles over the course of 6.5 years, MESSENGER has achieved what no spacecraft before has done. Mercury is now the final “classical” planet to be orbited by a manmade spacecraft, as well as the last of the inner planets to currently have an active orbiting research satellite of some sort. At 9:45 pm EDT this evening, after completing various burn maneuvers to enter orbit, MESSENGER rotated its antenna back to face Earth and returned data confirming success. Over the next few weeks mission engineers will be checking systems on the spacecraft, and on March 23 the instruments will be activated. The main science phase of the mission will commence on April 4. MESSENGER’s orbit about Mercury is highly elliptical, 200 kilometers (124 miles) above the surface at the lowest point and 15,193 kilometers (9,420 miles) at the highest. And as of today that is no longer the case. Congratulations to everyone on the MESSENGER team! Read the official press release on the mission site, or the article on Universe Today for more info. Also, check out this wonderful video by YouTube user nasagogblog showing some great photos from the MESSENGER mission, from assembly and launch to its previous three flybys of Mercury! It’s an amazing time in History now we eagerly await @MESSENGER2011 pictures check http://messenger. jhuapl.edu (as Above) end of March.